Bold bright yellow and green graphics feature two horse racing vigorously, one with #3 on saddle blanket. 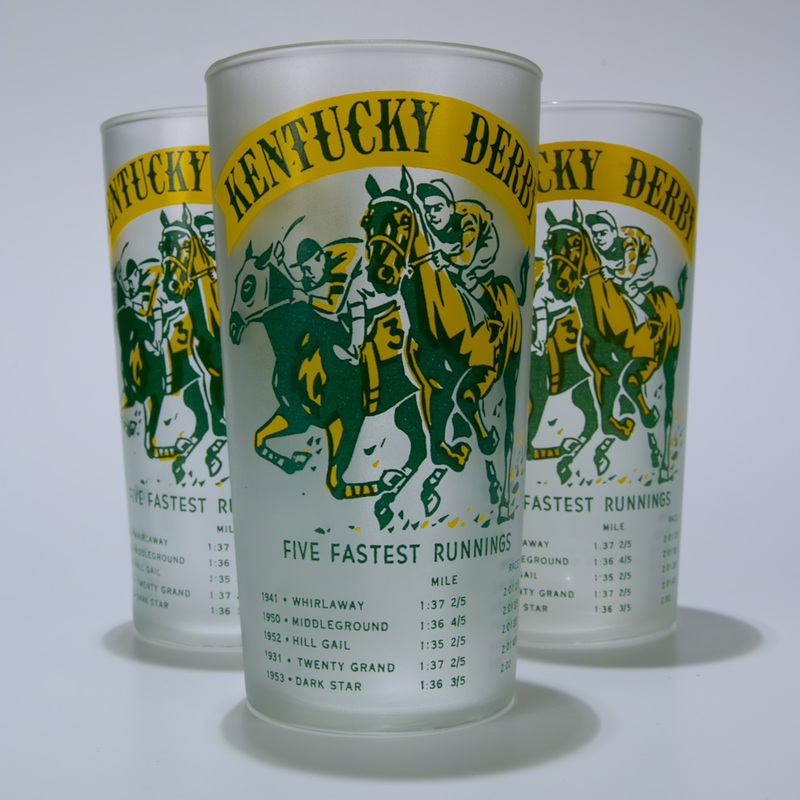 Five fastest winners names and times are listed. 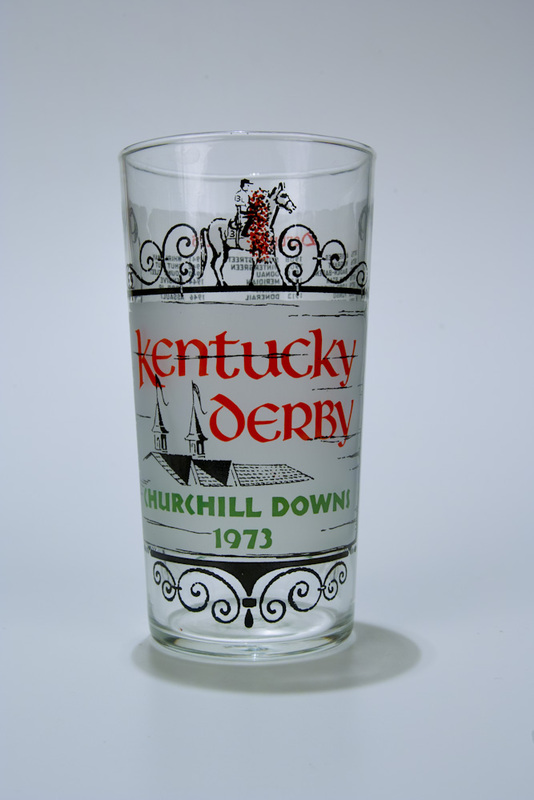 Black and red Kentucky Derby text is arranged diagonally with a large front view of horse and rider wearing red. Text is arranged diagonally with winning horses names listed randomly. 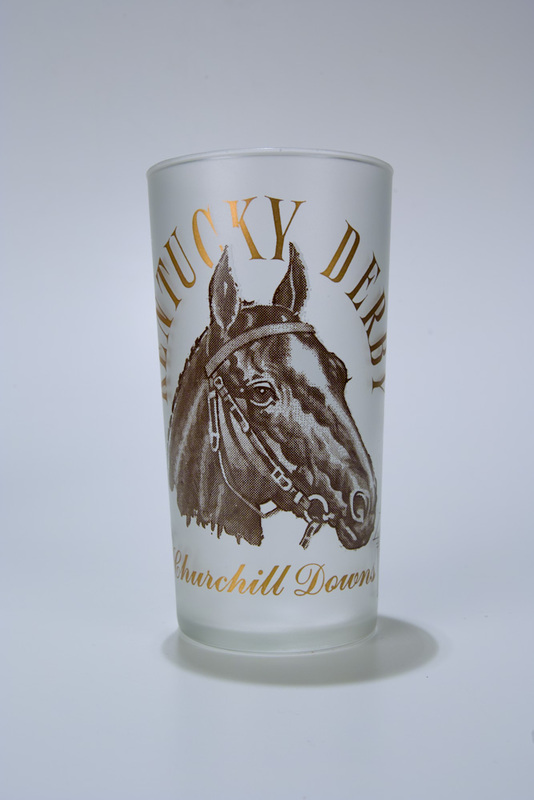 Mid Century black and gold graphics are well done and present Iron Leige on front of glass as the last winner. Graphics are slightly different on each side. Horse with #2 is featured on one side, reverse side has horse with #3. 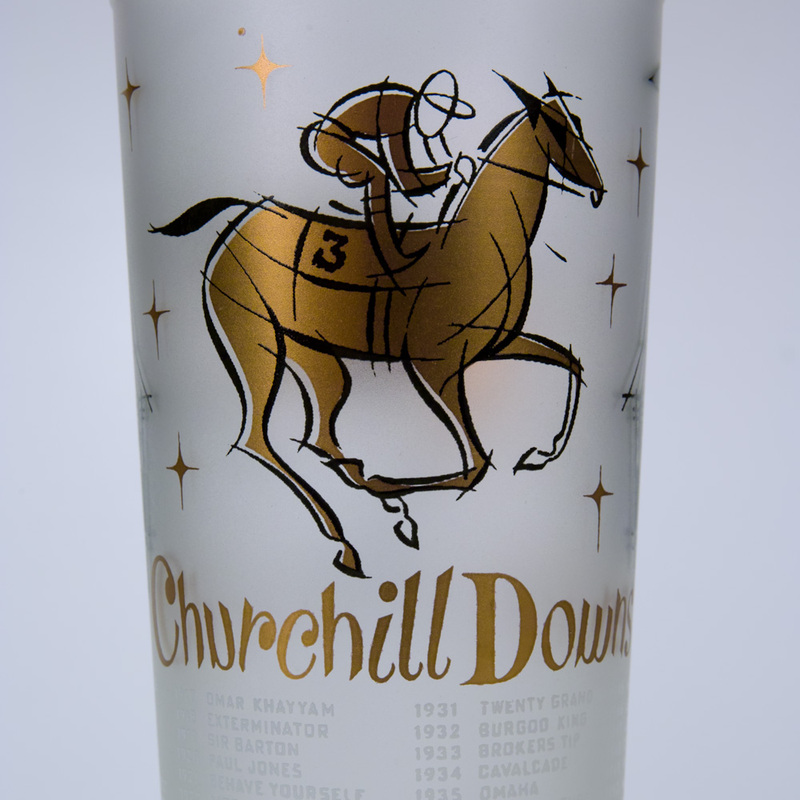 Gold gilt text arranged on frosted glass with winners listed in red text, rider on horse # 6 draped with an oversized rose collar. Steeples, jockey caps and horseshoes are accents. Brown and white with gold leaf text, the rider is wearing #7. In the background, the steeple of the track is visible. Jockey caps are the other decorative elements. 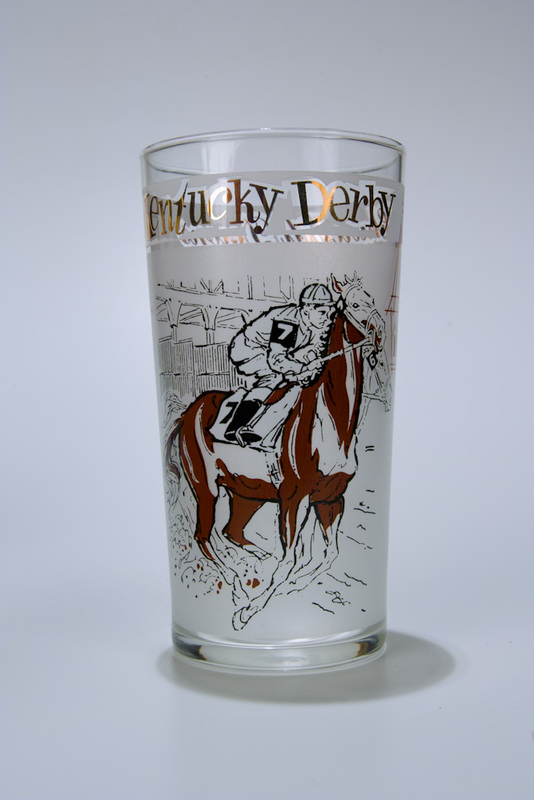 The brown and gold distinctive graphics on these glasses feature the head of a horse surrounded by text arranged in an arch. Jockey caps are the other decorative elements. Bold red banners float about the distinctive race track buildings and horse in brown graphics. 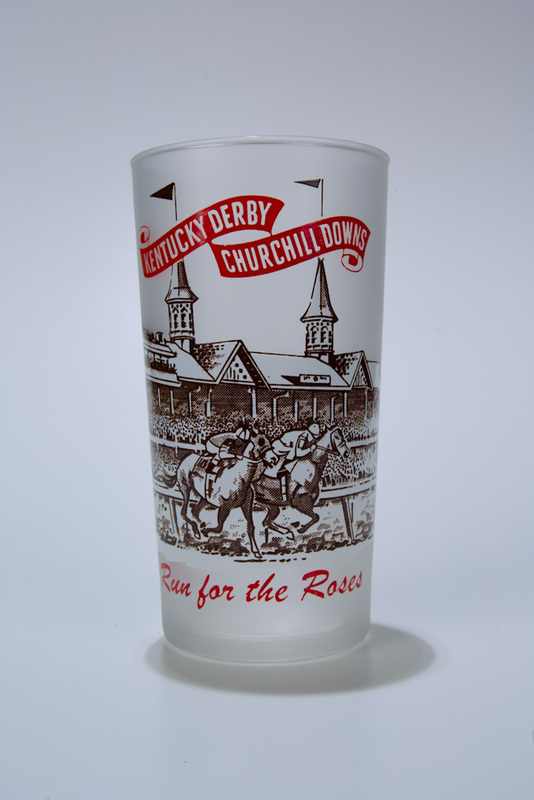 Glass is completely frosted and highlighted by red Run for the Roses text. Roses are depicted in a large bouquet on back of glass. Two riders on horses numbered 2 and 3 are depicted in a side view within a circle that is surrounded by gold leaf text. Four fastest running years are listed below horses. 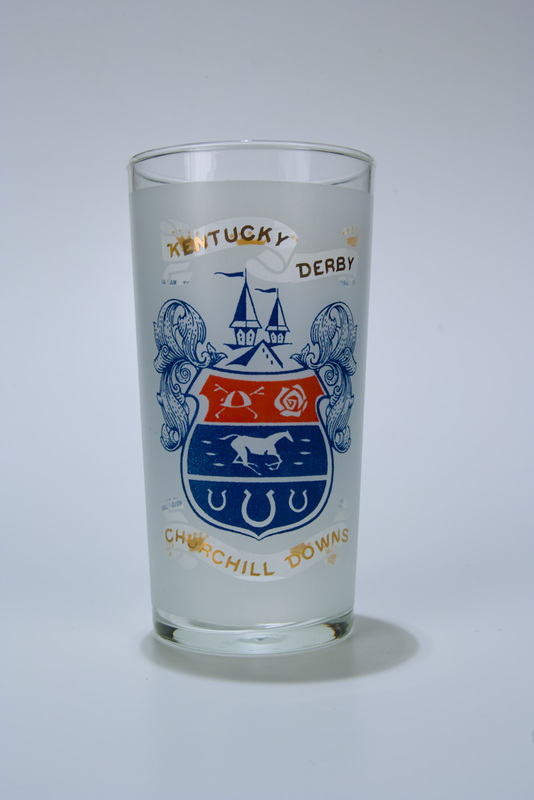 The famous steeples of Churchill Downs are on the back of glass. 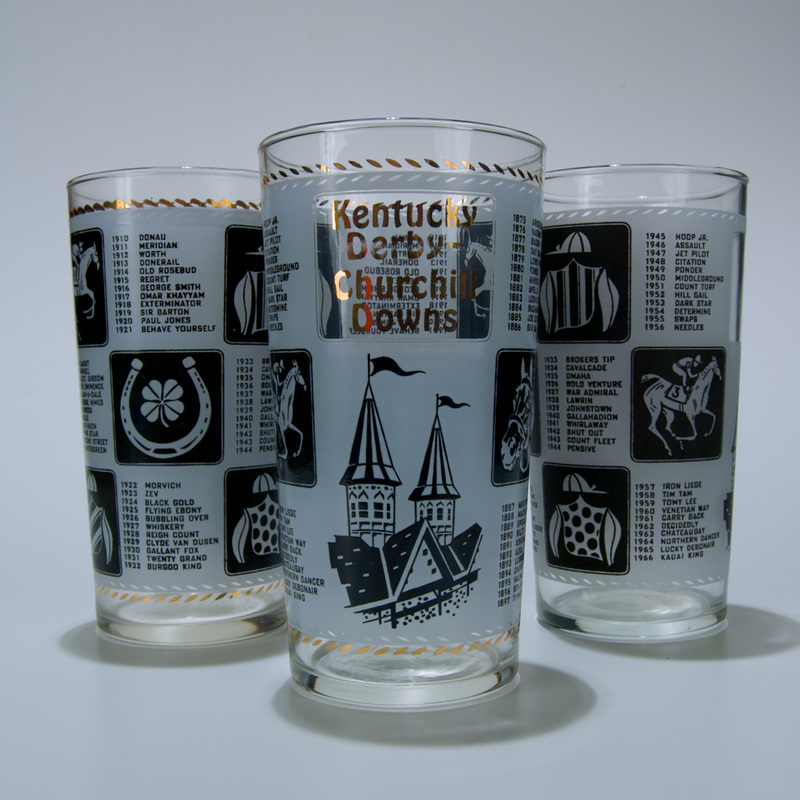 Black squares are filled with racing graphics, steeples with pennants flying and other symbols. Frosted white squares have lists of winners. Text is gold ink. The famous steeple banners fly over a red and blue shield with racing graphics. Gold ink is used for the derby text. 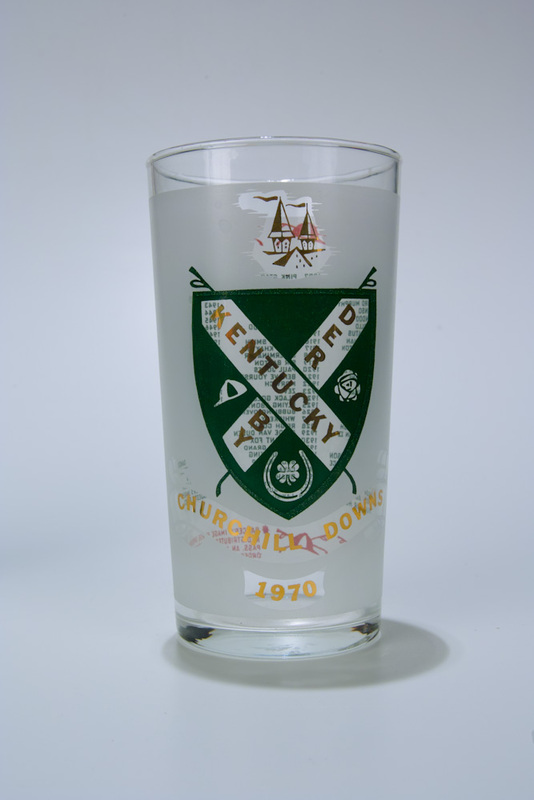 Green shield shaped graphics have a crossed ribbon detail for gold ink text. Red jockey caps are an accent graphic. 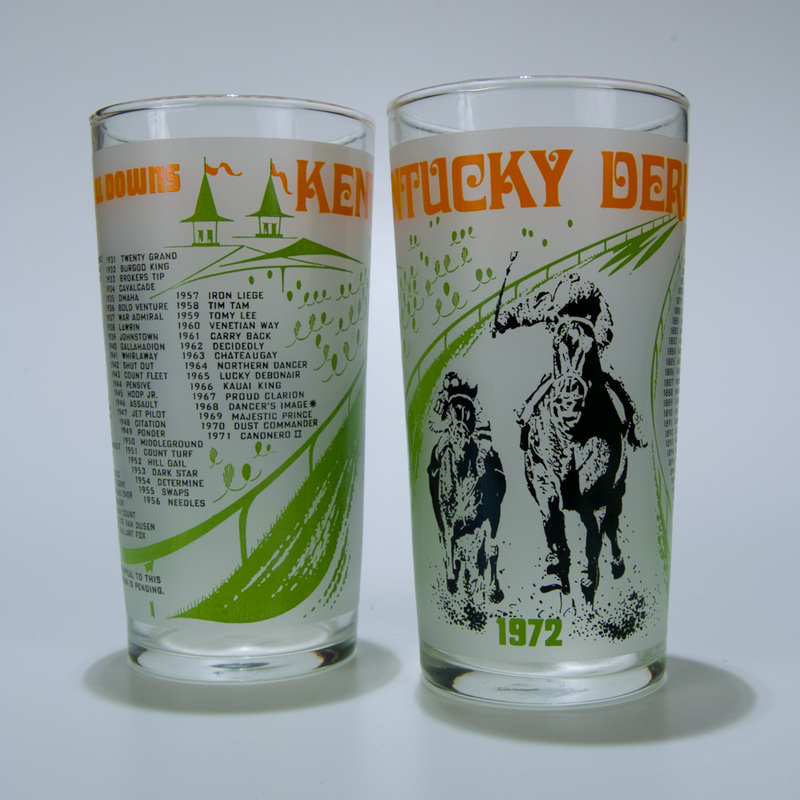 Orange and green graphics feature two horses charging toward the finish line. Steeples are in green with orange used for the text. 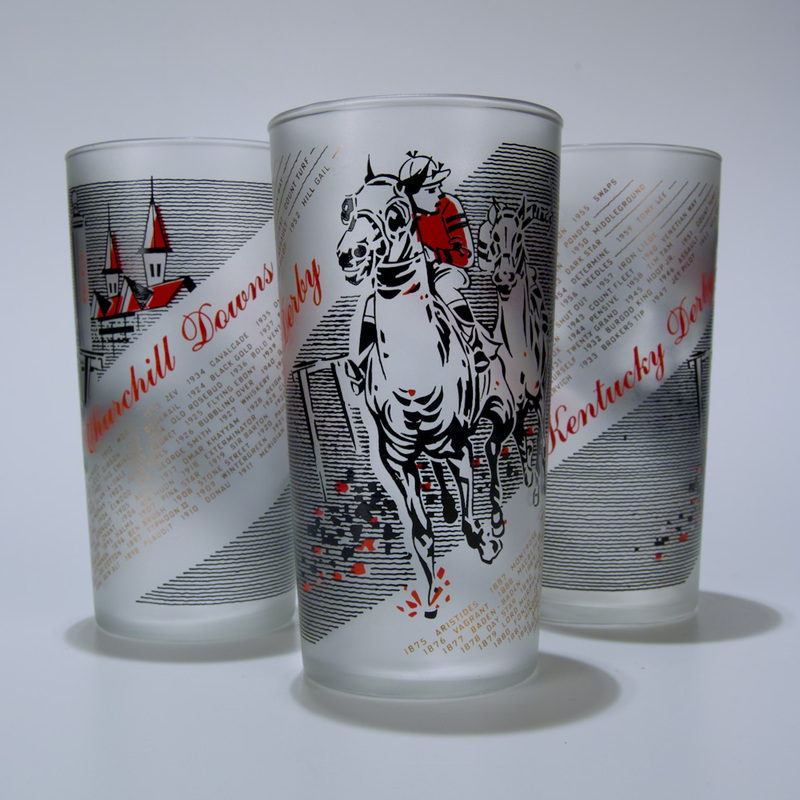 Elegant red, green and black graphics feature a rider and horse draped with rose collar and the famous steeples. Text and other graphics are in green. 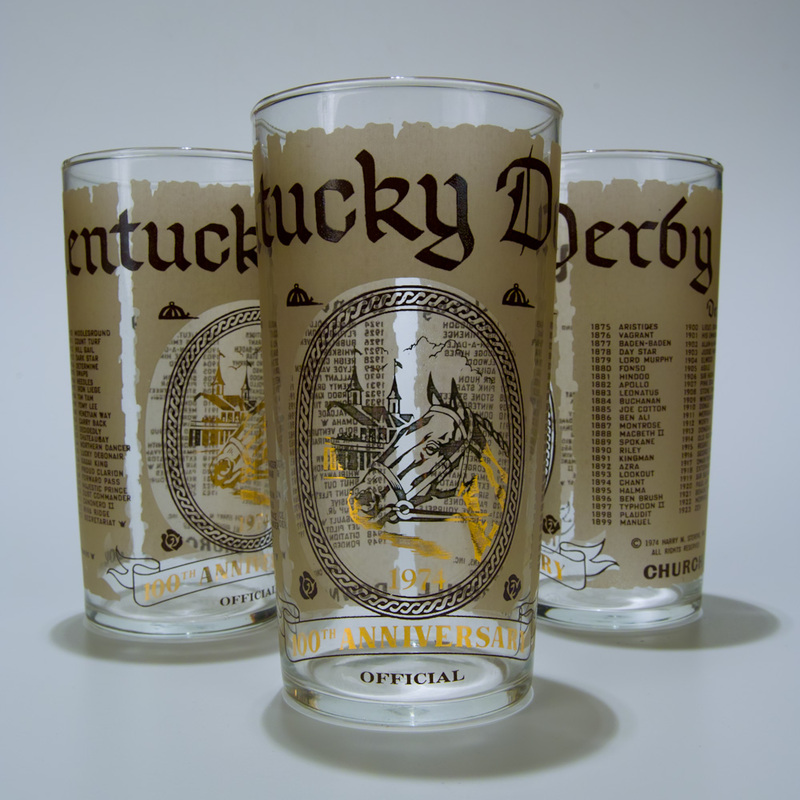 The official 100th Anniversary glass has a brownish tan frosted finish as the back drop for a horse head surrounded by a gold oval. 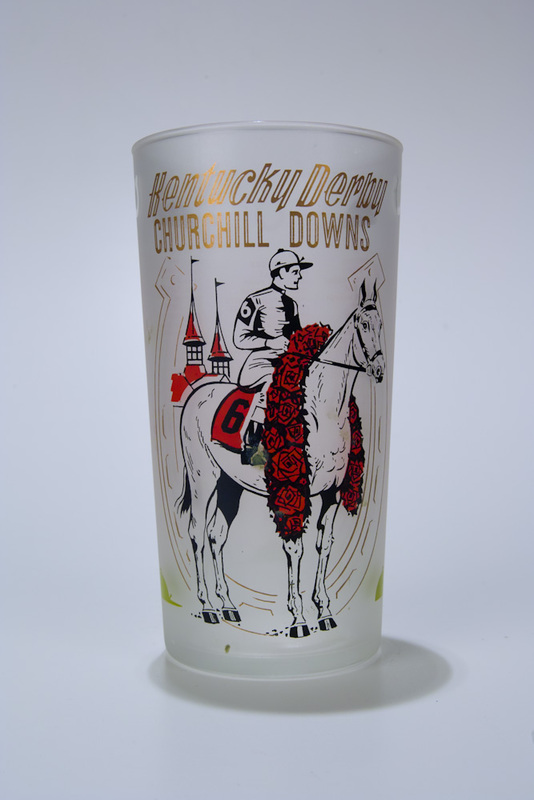 These vintage items are pre-owned by one family and were collected when new. 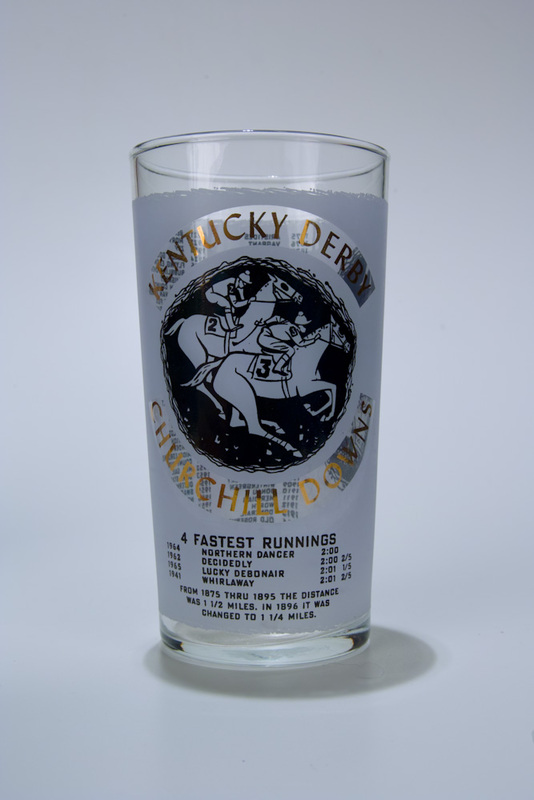 Used primarily for display they were recently discovered carefully wrapped in a family storage cabinet.